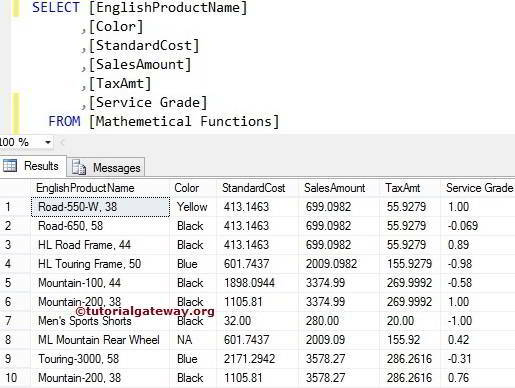 The SQL Server CEILING function is one of the Mathematical Function. This function is used to return the closest integer value which is greater than or equal to the specified expression. 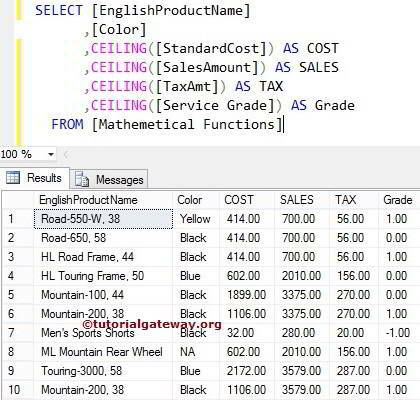 The CEILING Function in Sql Server is used to return the closest integer value which is greater than or equal to given numeric value. 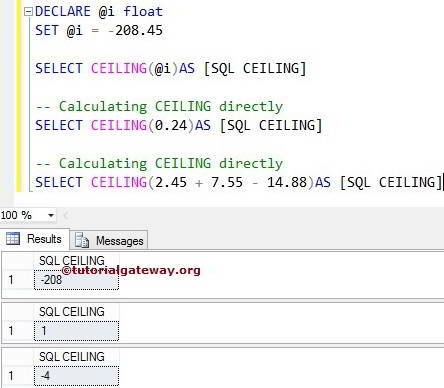 The following query will show multiple ways to use CEILING function. Within this Ceiling function example query, Below lines of code is used to declare float variable and assigning the value. In the below statement, We used CEILING function to find the closest integer value of the variable @i (It means CEILING(-208.45)). We also assigned new name to that result as ‘SQL CEILING’ using ALIAS Column. In the next statement, We have used the CEILING Function directly on the integer value. In the below statement, We used the CEILING Function directly on the multiple values. In this example, We are using the mathematical function table to demonstrate the ceiling function. For this demonstration, we are going to find the closet integer values for all the records present in [Service Grade] using CEILING Function.